A patient had brought me 3 lovely avocados last week, and two of them were ready to go. I threw this guacamole together in a flash. 1. Cut avocados in half, lengthwise, and pull halves apart. 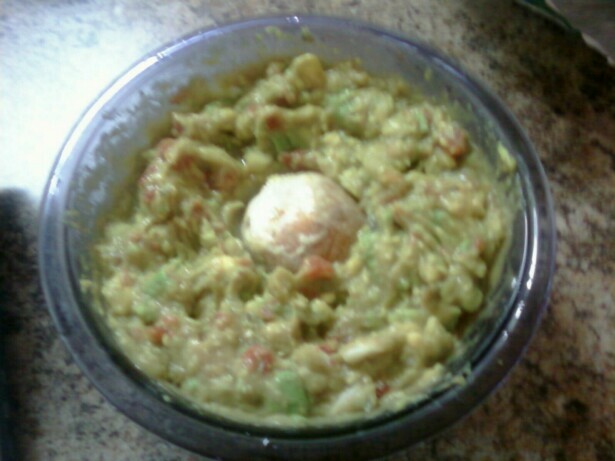 Remove pits and use a fork or spoon to scoop avocado flesh into a bowl. Reserve one of the pits if you like for the bowl. People say it prevents the guac from browning. 2. Mash avocado, lime juice, cilantro, salt, pepper and cayenne in medium bowl to desired consistency. Its nice to leave a little variety of texture. Plus it’ll mush up just a little more in the last step.